Print depicting a spirit woman with a round face surrounded by a lobed border, elongated appendages protruding from either side of the head, each with a ring at the end. The body is roughly ovoid shaped with two white tusk shapes that each have several black bands. Three short black fin-like appendages, and two long curved black and grey appendages on either side of the body. 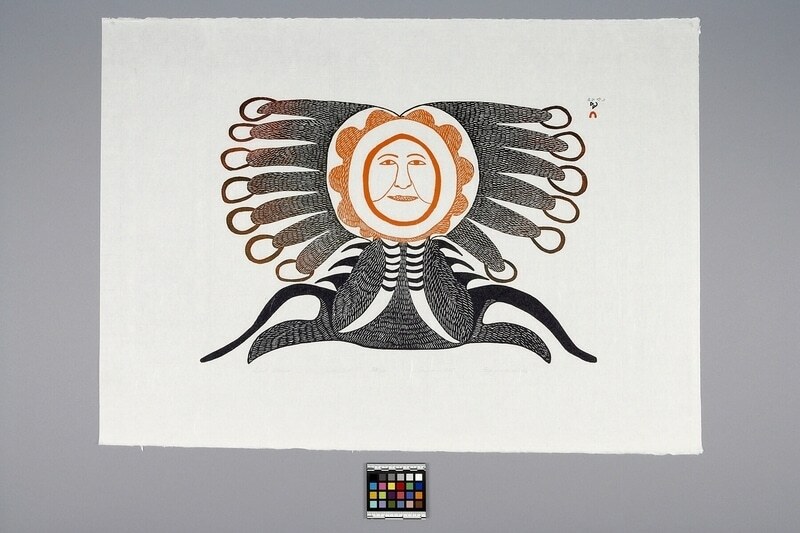 The name of the artist is written in Inuit syllabics above the name of the printmaker, also in Inuit syllabics, which is printed along with the Cape Dorset stylized red igloo seal in the upper right-hand corner of the image. The Canadian Arts Council blind embossed stamp is in the upper right-hand corner. Below the image is written, "Spirit Woman Stonecut 33/50 Dorset 1975 Eegyvudluk."